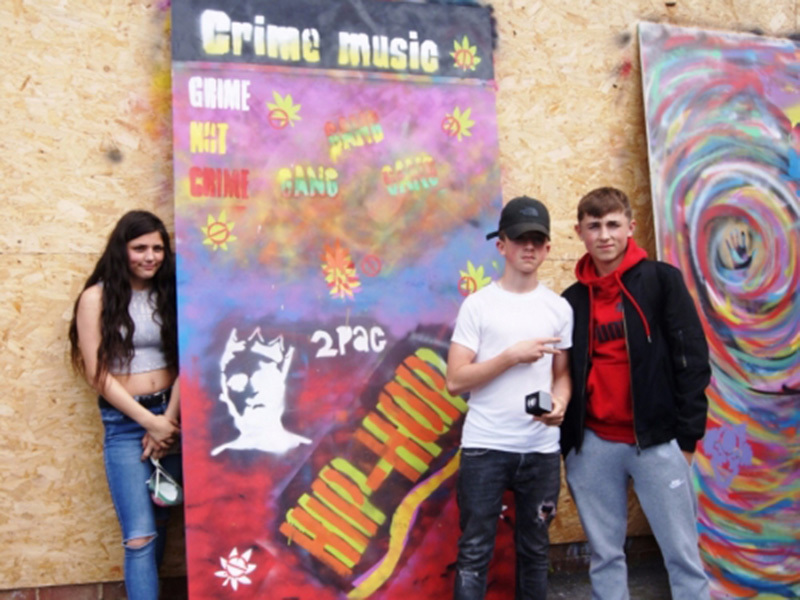 This year, thirty one of our year 9 and year 10 students have had the fantastic opportunity to develop some street art skills as part of the ‘BARK’ initiative. BARK, developed by Susan McCarthy at GFAPS and funded by Arts Council England and The Summerfield Trust, involves schools and youth groups across the Forest of Dean who have all selected students to work with a professional street art and mural specialists, Paintsmiths from Bristol. It is a chance for students to make a bold statement about issues important to them, as well as developing new skills, self-esteem and teamwork. Jack Dones from Paintsmiths and the BARK team from GFAPS worked with our students to develop skills and ideas leading to nine large scale artworks which will be exhibited at the Forest of Dean Sculpture Trail, Beechenhurst Lodge throughout September. Over the three one-day workshops students learned how to freehand spray with professional quality street art paints and how to design and cut multi-layered stencils. Jack also gave a really important talk, ‘Street-Art vs Vandalism’ emphasising the non-negotiable need for permission in all street art. We saw fantastic levels of engagement, collaboration and resilience from all students involved and we should be as proud of them as they already are of themselves! Feedback from students was very positive with challenging activities and a real sense of achievement at the core of the event. We are already witnessing the benefit of new transferrable art skills and growing confidence as students have been independently bringing their new skills into their GCSE Graphic Communication coursework! Thanks to the students involved for their brilliant creativity and meeting all expectations for engagement and behaviour and thanks to the visiting artists who facilitated the project sensitive to the needs of each individual. We must also thank all staff across the school, whose support has made it possible for our students to take part in this Forest community collaboration.